Remington UMC 40 S&W Ammo 180 Grain Full Metal Jacket ammo for sale online at cheap discount prices with free shipping available on bulk 40 S&W ammunition only at our online store TargetSportsUSA.com. Target Sports USA carries the entire line of Remington ammunition for sale online with free shipping on bulk ammo including this Remington UMC 40 S&W Ammo 180 Grain Full Metal Jacket. Remington UMC 40 S&W Ammo 180 Grain Full Metal Jacket ammo review offers the following information; Remington UMC 40 S&W ammo feature 180 Grain Full Metal Jacket bullets. Remington Ammunition presents the shooter with an extensive variety of premium bullet developed to combine with the strict manufacturing tolerances to create ammo with which any shooter would be willing to take the perfect shot. The Union Metallic Cartridge Company name for years has been synonymous with premium ammunition made in the United States. Over the years UMC has been innovative and has developed experience that has produced outstanding performance at a very economical price. Remington’s UMC division has produced only high quality products. With a muzzle velocity of 985 feet per second and muzzle energy of 388 feet pounds making the Remington UMC 40 S&W an outstanding choice of ammo for target shooting, practice shooting, and training ammo. 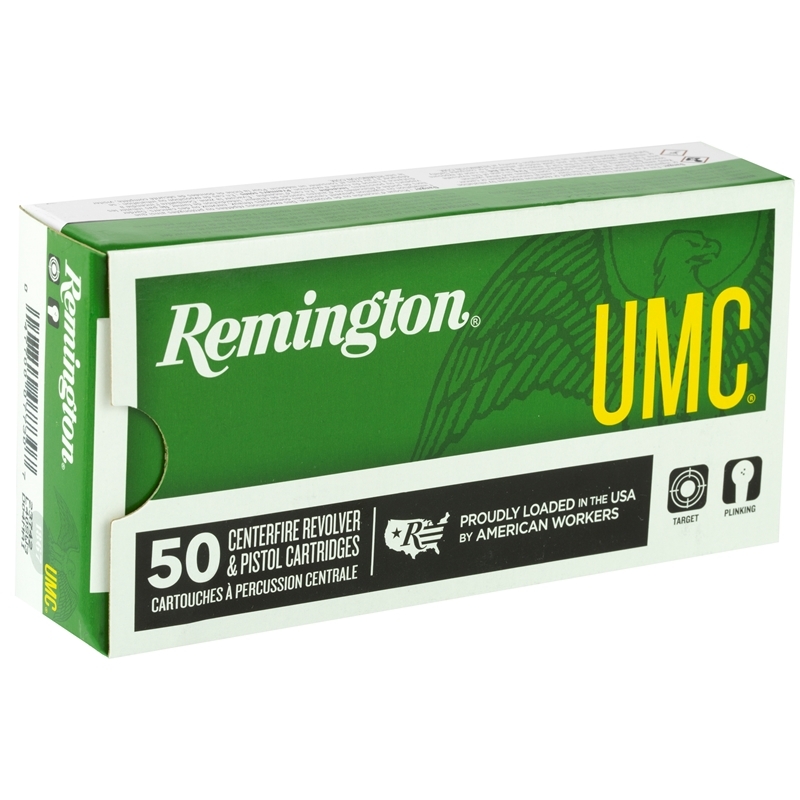 Remington UMC 40 S&W ammo is new production, non corrosive, reloadable, and features brass casing and Boxer primers. Remington has been a trusted brand for years when it comes to the production of good quality bullets at economical prices. Remington ammo is produced mostly for those shooters looking to go hunting. With the perfect ammo bullets for each caliber of centerfire rifles, rimfire, shotguns, UMC, and pistols and revolvers. The UMC division makes only first-quality product, in a limited line of popular specifications, so they can bring you the benefit of manufacturing efficiencies that keep costs low. The rifle and handgun ammunition made today is the product of 140 years of design innovation and manufacturing excellence. Whether for practice, target shooting or training exercises, UMC ammunition is a superb choice for high volume shooting and hunting. Outstanding Remington UMC ammo no misfires. i like this ammo alot and it have great pricing from target sports USA. Comes in bigger box... still goes bang. Response:Hi Richard, YES Remington UMC 40 S&W Ammo 180 Grain Full Metal Jacket ammunition features NON-MAGNETIC FMJ bullets. Thank you for buying ammo at Target Sports USA online store.